Southland Wood Workers Guild: BURT MUNRO SPECIAL AND WORKING BEE COMING UP. BURT MUNRO SPECIAL AND WORKING BEE COMING UP. There will be a working bee/club day on this Saturday 26th and maybe Sunday 27 of this month. An unusual mix you may say but the working bee is to remove unused heaters and chiller plus fit ventilation guards to the vents in the foundations. This task will require drilling 6mm holes in the foundation to accommodate the fixing tappets plus we may have to knock some high spots off the foundations so the grills fit better. Masonry drills and grinder, long extension cords and hammers required. We also need a pick and shovel to clear the vents along the car park. Ladders and pinch bars required to salvage copper tubing in the building plus if we have suitable ladders we should put our signs on the building. Inside task include mounting the notice board and photo boards plus some shelving in the display area. Depending on the weather and turnout we may have to complete the tasks on Sunday but that call will be made on Saturday. Depending on turnout and weather there may be the opportunity to use the day as a club day so bring a project just in case. 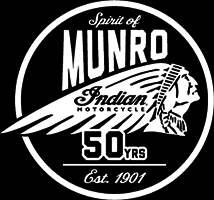 Because of this great Invercargill event it has been decided to open our display / shop area and workshop, for visitors to the Burt Munro races and others interested, so we can show off what we are and what we are doing. The sales / display / workshop will be open from Monday 4th February until Sunday 10th. Hands up please from member volunteers to man the 'show' and yes please bring items that you wish to have displayed or for sale thanks. See you on the 26th of January for a nice workout for your stiff muscles.